Encyclopedia Britannica has put much of their content onto the web – but usually only the first hundred or so words of each article are displayed. You must subscribe to read the rest, or you can register for a free trial subscription. But there’s another way! When the URL of the article has been clicked from a link on a webpage, the full text is displayed. Any links that you include in your website or blog will automatically take your readers to the full text version. Britannica endorses this technique, by the way, but warns that it won’t work for links from HTML files on your PC. Instead, you must host the HTML file on a webserver. I guess it won’t be long until we see a website offering links to every Britannica article, or a Firefox extension to streamline this process. In August last year, matttpotter1-ga asked Google Answers for help identifying a song used in epic movie trailers. He was even brave enough to post a movie and sound file of himself trying to sing the tune. Unfortunately we weren’t able to help him with that particular tune, but there are some resources that can help in many cases. Music search site midomi lets you search for music by singing or humming part of a song into your microphone. SongTapper lets you search for music by hitting the spacebar in time with the notes. MusiPedia, which bills itself as the Open Music Encyclopedia, lets you search by keyboard, note contour, singing, whistling or rhythm. The singing search is a Java application for which my browser didn’t recognise the security certificate, so I didn’t try it, but I was able to get it to find Frere Jacques using keyboard search, and Amarillo using contour search. Then there’s Themefinder, the one to use if you understand musical notation. You can search by pitch, interval, scale degree (“do re mi”), note contour, key and meter. I got good results with this one, except that its repetoire is limited to a few well-known classical composers and a sprinkling of folk music. Tunespotting lets you search by creating a rough musical score on the screen, or by playing your keyboard as if it were a piano. Posted in Research Resources | Comments Off on What’s that tune? Are you trying to identify a book? Perhaps it’s an almost-forgotten book from your childhood, which you enjoyed greatly but about which you remember only the vaguest details. Perhaps it’s a book you browsed in a bookshop and intended to buy later, but you can’t remember the crucial details. Perhaps it’s a book you glimpsed somewhere, or that someone recommended to you, and you thought you’d like to check it out some time. A service at whatsthatbook.com aims to identify your book for you. The service is free, funded by advertising and bookstore affiliate links. It’s run by former Google Answers researcher juggler-ga, who answered over 2000 questions for the now-defunct service, including many questions about books. At whatsthatbook.com, anyone can browse existing questions and answers, but you need to register if you want to ask a question or post a comment on someone else’s question. Meanwhile, work is continuing apace by other former GARs on a paid question-and-answer style research service. Stay tuned! Posted in Research Resources | Comments Off on What’s that book? At the end of 2006, Google retired its Google Answers feature, yet some of its more prolific researchers are continuing to make information easy to locate on the Internet. One such researcher is Henry Marcos. Known to Google Answers clients as “easterangel-ga” Marcos continues to be known as Easterangel at One Link Answer, a website where he has launched a free Internet research service. One Link Answer offers a unique spin on Internet research. While free answer sites have proliferated on the internet (EX: Yahoo Answers and Amazon’s Askville), One Link Answer has a slightly different angle as a free service; Marcos provides solid research in the form of a single link. Marcos added that he believes there is room for professionalism even in a free service, and that utilizing the skills of a professional researcher is the best choice. During his four years of service to Google Answers, Marcos answered more than 1,300 questions on a range of topics including business, history, health, and entertainment. Did you know that Wikipedia also offers an “Answers” service? Who would have thought it? Whilst reading Wikipedia's entry for Google Answers I was surprised to see Wikipedia Reference Desk listed as an alternative to Google Answers. 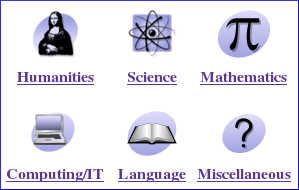 Wikipedia Reference Desk has six subsections: Humanities, Science, Mathematics, Computing/IT, Language and Miscellaneous. In true wiki style, answers are provided by editing the question and answer page. Almost a hundred questions a day are being asked. The tone is predominantly civilised, and many of the questions get good answers. You might say it's like Yahoo Answers without the yahoos. How do we stop our dog digging and chewing on the fence? Who is this guy Crazy Lenny? Did Maxwell Taylor have any injuries to his left hand prior to 1963? What does “OK” stand for in “OK Corral”? What does jjtc stand for? Not very different from Google Answers, in other words! More than 500,000 eBooks can be downloaded free of charge from the World eBook Fair during October (membership is normally $8.95 per year). The collection is a real mixed bag. It includes many titles readily available elsewhere (such as the Project Gutenberg collection), and it includes many long, dry government documents (such as WMD reports). But there are some real gems too. My favourite section is Renascence Editions – an online repository of works printed in English between the years 1477 and 1799. For example, you can read Queen Elizabeth the First’s “A Proclamation agaynst the maintenaunce of Pirates” from 1569. Probably the best place to start is with the World eBook Fair’s list of collections. For UK genealogists a gap in the records have been filled with the availability of telephone directories between 1880 and 1984. The 100 year rule on census returns means that there is little genealogical information available online for the 20th century. British Telecom through Ancestry.co.uk are now making available some of the telephone directories. Initially they are for London, Surrey, Herts, Essex, Kent and Middlesex, with the rest of the country following next year. Apparently there are listed numbers and adddresses for some famous people including Bram Stoker, the author of Dracula, Sir Winston Churchill, Harry Houdini, Laurence Olivier and Ian Fleming. The mind boggles that in those days you could pick up the phone and dial Sir Winston’s home.